IRVINE, Calif., Oct. 9, 2018 /PRNewswire/ -- VIZIO, Inc. announced today the introduction of expanded Google Assistant actions for VIZIO SmartCast TVs, granting consumers access to a wider range of voice control features. 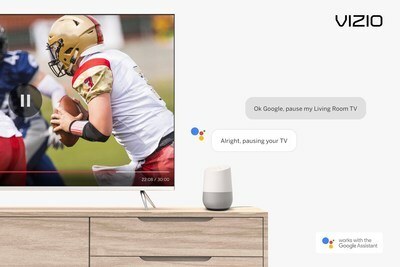 As mentioned in today's Google launch event in New York City, VIZIO SmartCast TV users with a Google Home or Google Assistant-enabled device, like the Google Home Hub, will have the ability to use simple voice commands for input selection as well as pausing, resuming, stopping, fast-forwarding and rewinding content. With voice control at the forefront of the smart home experience, VIZIO and other industry innovators, such as Google, are constantly working to deliver added value to consumers by embracing an open and expansive ecosystem model. The new VIZIO SmartCast features for Google Assistant will be available to VIZIO SmartCast TV customers in the coming weeks. VIZIO SmartCast allows consumers to enjoy added convenience through Google Home voice control. To pause, resume, rewind, or fast forward content playing on their VIZIO Smart TV, users can simply say, "Hey Google" followed by the command. This functionality also crosses over into volume control, allows users to switch their TVs' input and more. VIZIO SmartCast TVs provide everyday users, cord-cuttes and smart home enthusiasts alike with an unparalleled smart TV experience – serving as the ideal smart home companion with voice support for Google Assistant and Amazon Alexa. The versatile SmartCast collection of TVs deliver the latest in 4K Ultra HD and HDR entertainment, bring popular apps to the TV screen for easy access and grant access to thousands of Google Chromecast-enabled apps. For more information on VIZIO SmartCast visit VIZIO.com.